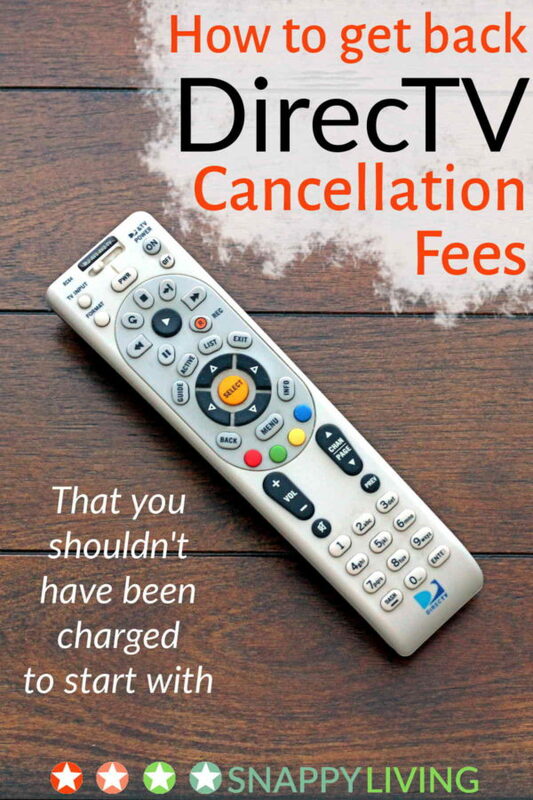 A while back, I wrote about the impossibility of escaping DirecTV cancellation fees, and they really do not state in the fine print that every time one of their crap DVRs breaks down and they replace it, your contract automatically renews for another 1-2 years. Surprise – you’ll never be out from under that contract. Turns out I have some really smart, savvy readers here at Snappy Living. Several of you tried various ways of getting out of your cancellation fees, or getting them refunded. Doug found the solution, and it has worked consistently for various readers (see the comments) for a couple of years now. Please note: Doug’s solution will probably not work if you’ve been with them less than two years. If that’s the case, they don’t care if you’ve been transferred to Pluto. They probably don’t even care if you’re dead. But there is another way to make them waive the cancellation fees – keep reading. One last note before we get to the solution: if it’s a practical option where you live, you might want to dump satellite/cable altogether and just go to streaming. I did it in 2009 and I haven’t missed it at all. Several of my friends report that the Roku Premiere HD and 4K UHD Streaming Media Player lets you access a ton of channels and streaming options. I still like Netflix because it has a lot of great current shows and documentaries, absolutely no commercials, and it lets you limit the HD quality so you won’t go over your bandwidth cap, if you have one. And of course there’s Hulu with a 30 day free trial if you click this link, with classics like The Mindy Project and Daria. And there’s Amazon Prime, which carries originals like Bosch and The Man in the High Castle and has lots of other benefits, like free two-day shipping. I have Netflix, Hulu and Amazon Prime, and I still don’t pay half what I was paying for cable. And instead of 100+ channels of stuff I just flick through in a haze of discontent, I have a ton of shows and movies I can watch on my schedule. Don’t waste your time with their customer service department (800-531-5000). Forget billing dispute (the Colorado address you have to write to). Call or write their corporate headquarters in El Segundo, CA, and it’s like you’re dealing with a whole different company. I wrote a letter to John Malone, who is Chairman of DirecTV in El Segundo, California, explaining my “frustration.” I have no idea what he’ll do, but I explained that I will do everything I can to make people aware of this ridiculous business practice. I also read about the class action lawsuit in California, and emailed the lead attorney to get some more information. If he writes me back, I’ll post here. This worked for Doug, who received a polite response. The letter did not accept any blame or fault – they’re making a “business” decision to settle things “amicably.” Read: “Oh, noes, we’re already gettin’ class action sued! Better play nice!” But hey, he got his money. Around the time Doug got his lovely reply, I got a meaningless form letter back from Billing Dispute in Colorado refusing to waive the cancellation fees. I decided to skip the letter writing and just call the El Segundo number Doug found: 310-964-5000. To my surprise, the entire phone call only took about 7 minutes. Update December 22, 2018: readers keep saying the number is out of service or redirecting to the 800 number. But that is only when the number is busy. Keep hanging up and redialing until someone answers. I’ve tested this and it still works. At first, you get a recorded greeting, and then it starts ringing. It may ring quite a few times – over ten both times I called. Then someone answers, and you say you’ve got a problem with a cancellation fee and Customer Service refuses to help. He puts you through to the “Office of the President”, where someone answers immediately. In my case, she listened to my complaint, and then put me on hold to review my account. She came back within two minutes to say they would refund the cancellation fee. I was afraid it was too easy. She had also said it might take ten business days to show up on my credit card. I gave them that, and it still wasn’t there. I called them again, and this time the call took only about three minutes. They reassured me they were processing the refund that day and it would show up on my card in a couple of days. And so it did. Good luck! If you care to share, I’d love to hear in comments how this works out for any of you who try it. This company really needs to be forced to revamp their policies. I don’t have a problem with contracts and termination fees in general, but with DirecTV: (1) their DVRs never last two years, and getting them replaced means your contract auto-renews, but nowhere in the fine print does it say this, and (2) cancellation fees should not be that high, ever. The above method probably will not work if you’re actually still within your contract period, but canceling for a good reason. Such as: you’ve moved to a place where satellites are not allowed and literally won’t have the service you’re paying for, or DirecTV lied to you about something when they signed you up. In that situation, the President’s office won’t help, but you can do what several of our readers have done – call the BBB and report DirecTV for their shady business practices. Within a few weeks, most of those readers got to quit without cancellation fees, or got their cancellation fees refunded. Reader Lucia just mentioned the BBB and the class action suits to the customer service rep, stating that if the supervisor didn’t remove the cancellation fees, the call would end and Lucia would phone the BBB. That worked for her. Many people want to keep DirecTV, but have to move to a place that doesn’t allow satellite. Reader Sam Murch got out of a contract by having them come out to install it at the new place. Sam’s apartment did not have a “line of sight” to the satellite, so DirecTV had to cancel the contract. However, reader Rob reports being required to get two contractors out for a cost of $100 to confirm the line of sight issue, and they still insisted he pay the cancellation fees. Unbelievable. We recently moved from CO to TX and moved into a mid-rise apartment. An apartment that has no balconies or any other place to put a dish. They gave me the same crap saying I would have to pay the cancellation fees and we had just signed up a few months prior. We canceled and went ahead and paid the fees then began fighting. Talked with customer service, resolution center. They all said the same crap. That I needed to pay to have a tech come out to my apartment and confirm no line of sight. Well that is ridiculous, all they need to do is drive up or even take a look at google earth to see it is physically impossible to install a dish. I filed a complaint with the BBB. Got a reply in a few days and all of our fees refunded back to us. I also let the BBB know they change the price after they’ve got you in a contract. I hope this helps some of you and I hope they change their business practices. I will never sign another cable contract in my life. March 26- Tried the 310 phone number shown today to get my cancellation fees stopped and the number now routes callers to the lower tier customer service team. Tried twice – once I got CS in Las Cruces, NM, then got CS in Boise. Seems like DTV has figured out this number was a problem for them. Definitely let the BBB know what they’re doing! Several people who had no luck with the phone number have gotten their money back within weeks of filing a BBB complaint. Please, contact BBB, Consumer Affairs and Attorney General…and watch my video on YouTube. Stand up to these crooks! I tried this on 03/29/2015 and it worked! I was very upset and I let them know that I thought the company was a scam, as I had no clue that I was under a contract, just because of their faulty receiver. I had already called the 1-800 number and did not have any luck, representative was rude and mentioned that I hadn’t read the “fine” print on the hand held device. The 310 number worked! The person that I spoke to mentioned that this is a mistake cause by the individuals who replace the faulty boxes or a system error. Either way he let me cancel the service and I will not be charged the termination fees. I got his name and his ID number, so I’m hoping that all of it is true, when I get my last Direct TV bill in 7 days. I tried calling the number above and hit a CS rep who basically told me the same stuff the last person did and that person’s supervisor told me. Well, I got put through to another supervisor and told her my truthful sob story and she agreed to get the cancellation fee waived. Despite what you will hear, don’t believe it when CS says that “no one” can waive the fee! Some people must have all the luck. I have had Direct TV one time before at an old house and had no problems. This time I cancelled after one year due to financial hardship. I did the above instructions, but they absolutely would not budge on the early cancellation fee. Maybe some people did it and succeeded before this information was common? I will be paying $170.00 that I really can’t afford to lose. Maybe if I write to the Attorney General’s Office in my home state……..
Christopher, it’s a two-year commitment, so you actually are terminating early and they won’t budge. This post is for people who stayed at least two years, and then still got early cancelation fees of several hundred when they left. Welp, didn’t work for me. Didn’t know they automatically renewed my svc for 2 more years when we moved last year and now we need to cancel bc we can no longer afford it and they want to charge a $260 cancel fee. I tried to tell them that they never explained any of this to me and to send me my signed agreement where it shows I was being renewed. They said they would email me and I still haven’t received anything. Don’t know what to do now. Two options: one, try it again, and see if you get someone else at the President’s Office who’s doing it right. Two, just file a BBB complaint. That’s worked for a number of people in these comments. What happens is, you file the complaint, and 2-3 weeks later, you get the money back if you already paid it, or you’ll get a letter stating they’re waiving the fees if you haven’t. I filed a complaint with the BBB trying to get out of the cancellation fees and they denied me. The rep who sold me the service told me their was no contract, and when I cancelled, all of a sudden, I have a 24 month contract. They said it was disclosed in our telephone conversation but did not send proof. I know what I heard. They refuse to waive the fee. Yeah, they will not waive it if you’ve been with them for under 24 months, because technically it’s in the contract terms online – which you’re supposed to somehow know about even if they didn’t tell you about them. It’s not fair. Hello, I just signed up with directv a couple months ago, I live in a “multi dweller” unit so I had to sign up with a third party. I was able to access my cable about 30% of the time. 70% of the time one of the satellites were down. The on-demand service wasn’t working – I was told by directv that I had to have a >75mbps internet speed in order to use on-demand (not true) and when I called I was told it would cost $440 to cancel my contract – even though I am unable to receive the services I am paying for. Today I have spent 3 hours talking with directv. Unfortunately they have wised up to the number above. I talked with two representatives, and then an incredibly rude supervisor. They all told me that when I upgraded my equipment so that I could have on-demand (which doesn’t work) I extended my contract to a 2 year contract. Even though previously I had spoken with a representative who confirmed that I had a 1 year contract. I’ll try to contact John Malone although I’m not feeling very hopeful right now. This is an unethically run company. So far, no one who is actually under the 24-month contract period has been able to convince DTV to drop the fees. I’m guessing they just don’t even consider it in that case. Which is unfair because, as you say, you’re unable to use the product, which means they’re not delivering the service you’re paying for. Good luck – you might want to try filing with the BBB if DTV doesn’t come around. Thank you, I actually just finished filing a claim with the BBB! I said that I would be agreeable in paying a $200 penalty since I initially signed up for a year of service – this 1 year contract was confirmed by a representative I spoke to today. But later they informed me that I never had a one year contract and that this was incorrect. I should have asked her to send over the documentation. If I could actually watch the TV shows and programs that I am paying for, this would not be an issue. In medicine we cannot bill patients for services not given – that is fraud. I”m not sure how this is any different. Now that AT&T paid billions for Directv,they pushing it inthe stores.My wife go to the store with a cell phone issue and before she left the pitch man told her of all the money she save by switching to Direct.To make a long story short they got it hooked up a week later and there service is less than AT&T.lost signal,poor Programing and about 60% of the channel are selling something.I called about cancelling and customer service in Utah became a Collection mgr type .The never got a copy of the contract with $48o fess.I called AT&T and there nothing they can do….they owe it?They were happy to reconnect us.I have 44 days to pay up or the sue me.Thats what the customer person told me.They have a 24 hr collection clause. You buy a used car one gets to test drive it not Directv. There is at least one class action suit already, and DirecTV has successfully dragged it out for about 4 years now. They derailed it by countersuing and saying customers have to sue them in private arbitration because that’s what their contracts say. So this is actually going to the US Supreme Court, which will decide if arbitration clauses can be binding. If they decide they can be, then it will be impossible to have a class action suit against any company ever again (because any of them NOT using arbitration clauses would immediately start using them). And they have a history of deciding against class action suits, so it’s probably going to go against that, and that means everyone will have to arbitrate with DirecTV and other scumbag companies, and they will pick the arbiters who will decide that nope, you owe them, pay up! Don’t you just love the US legal system? < --sarcasm One small pleasure I get in life: whenever I'm in a store and a DirecTV rep comes up to me, I tell him or her a bit too loudly about this post and why I would never, ever consider dealing with DirecTV again, so the other customers will hear it. For months my mom was trying to get out of contract because the apartment she was moved didn’t accept satellite dishes. The service was suspended for 4 months and by November she had to pay 160 to pay off the fees. I called the number completely different call center at first the lady said sure no problem than when I was giving her my address to send the equipment return boxes she brought up the contract after about 15 minutes of going back and forth I said I am not paying for cancellation. She said she would get an account manager than I said I have an account for my house can we use the credit towards my account she figured out that it was also under my mom’s name and after 5 minutes she merged the accounts. I than asked about getting a promotional discount and she did offer me 20 discount. Thank you for the post saved me a lot if money. My husband is a cop & We are relocating to a different state for his work. They don’t care. On either number. They said they won’t even wave military unless you’re deployed out of country. What heartless jerks. I also know they NEVER mentioned a two year contract over the phone. Crooks!!!! I have to disagree as in my experience it was very well disclosed. No way am I apologizing for DirecTv, and landed here only because I am thinking about dropping them. I just wanted to share my experience. Maybe things have changed since you wrote this. I don’t think they’ll let you out. They’re going to say you should’ve known last week you couldn’t afford it. Now, if something changed in the last week, like you lost your job, you might try calling the BBB, like we talked about at the end of the article. Good luck! I ordered the service several months ago anticipating a roommate. The roommate deal fell through and now I cannot afford the service. I’m willing to pay the cancelation fee since that was the agreement. I just cannot have it all come out at once. I’m now using my primary checking as my method of payment but will switch it to another account prior to canceling just in case I experience issues. Has anyone ever paid the cancelation fee in installments? I really cannot afford to keep doing this monthly. You know, if I’m remembering correctly, they offered that as an option when I was arguing that, having completed my contract several times over, I wouldn’t pay any cancellation fees. So give that a try! I hope they are reasonable with you. Watch out! If you been thinking twice about not paying the cancellation fee. Just be late on your Bill. They will take while and not comunicate.Than wham debits the whole amount when you least expect it from your card on file. Stating after the fact they sent out a letter imforming of a time of 15 days after the DATE Of the letter. Your card will be debitedvespeciallyvif they have not received equipment back. When if it’s more like 33 days plus knowing they got word equipment was shipped. later on top of fees. They took it all! Sad has no rent. 700.00. Sorry. I’m just mad. He is blind and is my 84 year old Sad. Paid on time faithfully 25 + years. He got in a hardship with his body. Sent cancellation letter. Called.3 times.each week Has to wait total a month on shipping label. The day it came and he called them to inform. They day zapped out money 33 days no word to him when he called. !